Vibrant, sunny Summer is too busy having fun shaping sand castles, jumping in the waves, gobbling berries, and camping under a blanket of stars to do her chores. But it's not until she hikes to the top of a mountain and sees the dull, parched land below, that she realizes what she has done. Summer grabs her sprinkling can. Is she too late to make amends? Lynn Plourde's and Greg Couch's seasonal saga of Wild Child, Winter Waits, and Spring's Sprung comes full circle with this summertime celebration. 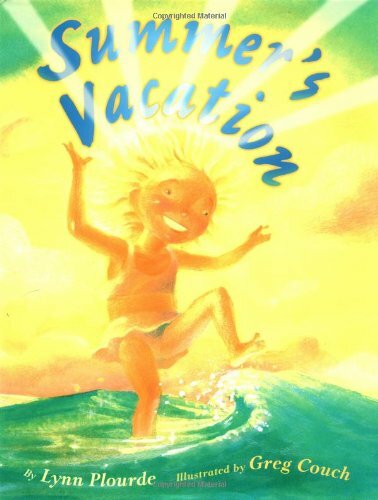 Plourde's playful words capture the frolic and fun of vacations, while Couch's glowing, golden illustrations radiate off the pages to warm the hearts of children of all ages. If you have any questions about this product by Brand: Simon n Schuster Children's Publishing, contact us by completing and submitting the form below. If you are looking for a specif part number, please include it with your message.